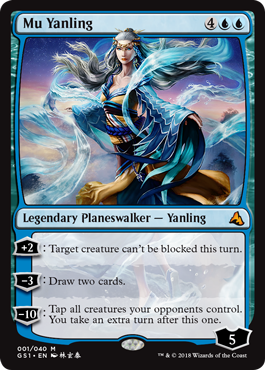 The second of the Global Series’ China-specific planeswalkers, Mu Yanling is a rather unique addition to blue’s stable. A six-mana blue planeswalker is usually positioned to be a finisher, but her +2 and -3 abilities are more geared to, respectively, developing an offensive position and consolidating mid-game card advantage. A control deck with few creatures is likely to be wary of a planeswalker with a +2 that’s not especially useful to them. On the other hand, a more midrange style of deck – Jeskai or Temur feel especially appropriate – will benefit from both of those abilities, as will anything with “saboteur” creatures like Sedraxis Specter. Her ultimate is actually pretty cool, although it’s not quite as “you win now” as the various Jaces or even Tamiyo. Again, it’s better in those midrange and/or saboteur decks, but it’s pretty good at taking out an opponent in a targeted manner and also giving other planeswalkers you control another turn to do their thing and get even more virtual card advantage. I think with two abilities that deal with fundamental elements of Magic in a solid way, Yanling has decent prospects for casual play. For a simple planeswalker, Mu Yangling has a couple of potentially interesting interactions. Starting with her +2, which enables an unblockable strike by a creature, and extending to her -3, Divination on a stick. She comes in at 5 loyalty, which means that you can potentially stretch her out to draw four cards and make something unblockable along the way, a fair deal for six mana. (Even if it spread out over three turns, it still counts!) And she lives through all of this, so anything else is icing, more or less. That said, her ultimate is powerful. Very powerful, and it actually scales well to multiplayer. On one hand, she wants you to have board presence to make it work; the value is in being able to swing uninterrupted on two occasions. Otherwise, it just is another “take an extra turn” spell that you have to wait to pop (she needs to use her +2 thrice). She notably combos with Doubling Season, but the list of planeswalkers that don’t combo with that spell is very short indeed. Like Jiang yesterday, she’s nowhere near good enough to see play in eternal formats, but the threat of her drawing you a lot of cards is nice indeed.